This OEM replacement Wastgate actuator is available for all MPE-750 Weber motor configurations. 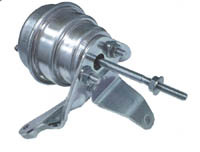 You can find all the replacement linkage and components here: http://www.weberpower.com/hydrospace-2005-2006-hsr-s4-turbocharging-waste-gate-valve.html to the wastegate components that are located on the HSR page. The Textron MPE-850 requires a different actuator, and you can find it here: http://www.weberpower.com/mpe-850-marine-tc-exhaust-system-exhaust-manifold.html.